December is here and that means we get to introduce you to another great stamper! Our Guest Designer for December is Kathleen Benedict. Welcome Kathleen!!!! For her first creation Kathleen used Baked With Love which is so timely since it's the time of year when we all love those yummy baked goodies!!! Kathleen is not only inspiring us to make cards...but make cookies too! 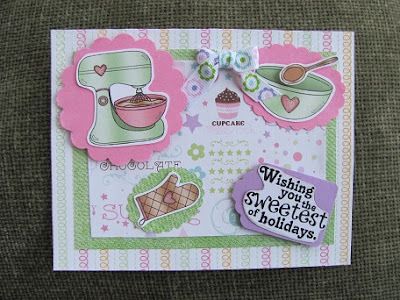 I originally started stamping for scrapbooking and got into making cards to utilize my supplies. A friend told me about digital stamps and I fell in love with them. I love that you can resize them, and I have found that I love coloring them. Plus I love having something useful to send at the end of the process. I keep my cards pretty simple and almost always do an A2 size as I mail my cards away. For that reason my cards are low profile and not too fussy. Clean and simple probably best describes them. You can find more of Kathleen's creations by visiting her Splitcoast Stampers Gallery. Come back next week to see what she has in store for us...she might just be using a cookie. What a SWEET card (no pun intended...OK, maybe a little bit)! I love how you used the set. Welcome, Kathleen, and thanks so much for being our Guest Designer this month! I can't wait to see more of your fun creations. Hop Along With Us & Win!